Honda says it chose Marysville, Ohio, for NSX production in part because it has nurtured engineering and manufacturing talent there for 30 years. MARYSVILLE, Ohio -- Honda officials hope the revived Acura NSX, an advanced hybrid sports car scheduled to arrive in 2015, will strengthen Acura's luxury footing. "We have a very clear understanding of the high customer expectations luxury buyers around the world have for a supercar, and our challenge is to exceed them," said Ted Klaus, project leader for the NSX. Honda Motor Co. said last week that it will invest $70 million here to assemble the NSX. 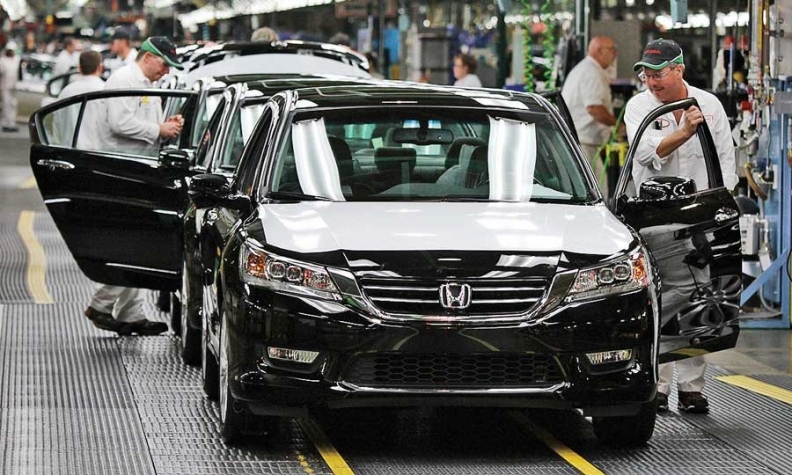 The plant will be staffed with about 100 specially trained production workers and equipped with robots to build the all-wheel-drive car, Honda said. The 184,000-square-foot plant, to be called the Performance Manufacturing Center, is adjacent to Honda's Marysville plant that assembles the Honda Accord and Acura TL sedans. Workers will be recruited from within the company to assemble the NSX. "There will be exclusive weld, paint and assembly, and vehicle service departments," said Clement D'Souza, associate chief engineer at Honda of America Manufacturing Inc. The size of the production crew and the vehicle's complex lightweight body structure suggest Honda plans to build the car in limited numbers. Honda has not given a sales forecast for the NSX, and company officials did not talk about prices or marketing plans. In March, Honda signed a new advertising agency, Mullen of Boston, for the Acura account. Acura trails rivals BMW, Lexus, Mercedes-Benz and Cadillac in sales. Hidenobu Iwata, president of Honda of America Manufacturing, said Honda chose Marysville for the new NSX in part because of the engineering and manufacturing talent it has nurtured in 30 years of building cars in Ohio. "The location of this facility is in the midst of one of the greatest collections of engineering talent in the world," Iwata said at a plant ceremony. The car will have a pair of electric motors driving the front wheels and an electric motor sandwiched between the engine and transmission, which is located behind the driver. The car will be built in both right- and left-hand drive and will be sold around the world. The car will be called the Honda NSX in markets in which Acura is not sold. Iwata said Honda decided to bring back the NSX because the company wants to showcase its engineering and technology. He said, speaking through an interpreter, that the high-powered car will be very fuel efficient and would not affect Honda's corporate average fuel economy goals. "It's going to be a multimaterial body. It will have steel, aluminum and carbon fiber and maybe more. This car will perform on a level of a Ferrari or even a higher-level vehicle," said Honda's Klaus. The vehicle's V-6 engine, dual clutch transmission and electric motors are likely to come from Japan, and many of the body pressings will come from other Honda facilities. Honda built the first-generation NSX in Japan from 1990 to 2005. It was a low-slung, lightweight aluminum-bodied coupe packed with technology, but the car never sold in large numbers. Of the 18,685 NSXs built, about 9,000 were sold in the United States. Through April, Acura's U.S. sales were up 14 percent to 48,852 in an overall market that has climbed 7 percent. Acura's car sales rose just 1 percent and truck volume surged 30 percent, with the redesigned RDX crossover accounting for the bulk of the gains.